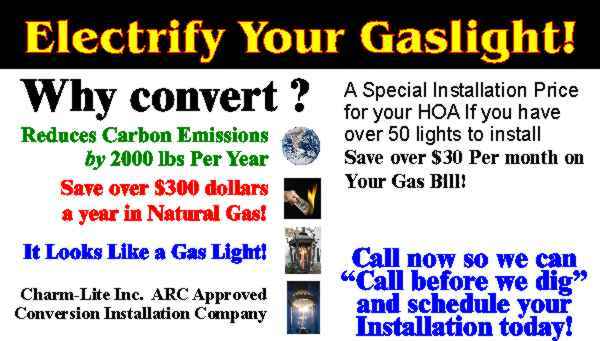 Standard Installation Service Conversion List Price [INST] - $350.00 : Gas Light Conversion to LED!, Looks like a Gas Light! We want your help in solving the problem. It is about creating the most impact in a timely fashion. It can mean the difference of saving hundreds of dollars in installation trip charges. If we can help with your campaign to save energy, please don't hesitate to request our current downloadable sales packet. We have many affiliations to contractors who are successfully installing all over the country, from Las Vegas, to Virginia, Sarasota to Cleveland. Our network of installers continue to service what we sell with service contracts to do everything from complete installs, preventative maintenance like bulb change outs, to damage repairs of any kind. The installations are usually identical, burying a wire from the side of the house where the utility locations are to the post. Our system uses a safe NEC voltage with NEMA approved surge protection necessary when running power outside your home. We will work with your neighborhood to give a consistency in the overall beauty the gas lighting has provided by consistently providing a uniform warmth and brightness that will last a lifetime with mantle equivalent bright warm white LED bulbs that last 5 years at the cost of less than $3 a year per post lantern. Our installation crews are also available to roll out a bulk installation for a 20% discount of $280 per lamp to be installed all at one time. Let me know how we can facilitate a smooth and successful retrofit of your existing gas lighting to our LED system.